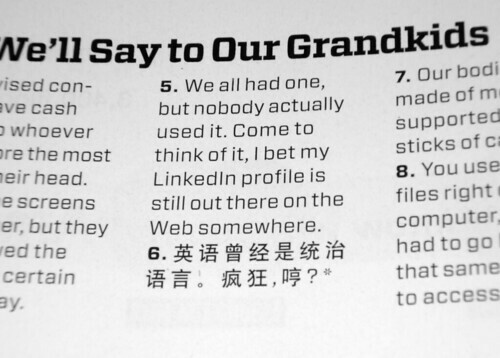 In the latest issue of Wired magazine, there was a piece titled "10 Best Things We'll Say to Our Grandkids". "English used to be the dominant language. Crazy, huh?" Dr. Mair and I both noticed the printed Chinese is not correct. 统治语言 (dominate language), is two English phrases spliced together with an odd sense of colonialism. 官方語言 (official language) or 國際語言 (international language) would be better fitting. 疯狂 does not have the same contextual meaning as "crazy", rather "frenzied, unbridled; insane". In this case, a better phrase would be "傻不傻", or "isn't that silly?" Perhaps this is a nod to Firefly, where mixture of Chinese Mandarin phrases were added into the show's dialogue.